Part dramatic reading and part yoga practice, this will be a time to breathe life into your mind-body connection.Grow in reverence for the inner workings of your body. 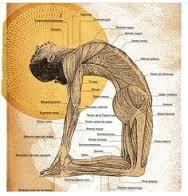 We will explore several organs of the human body and how yoga poses nurture organ function. Come to celebrate your deep self, explore movement and the body’s interconnectedness, and learn anatomy and the poses to support your health and wellness. The dynamic duo of teachers includes Kelsey Maddox (writer, public speaker, spiritual former, and wellness enthusiast) and Amanda Cole (personal trainer, yoga instructor, and creativity enthusiast). You can also just show up at the studio on Saturday at 2. Yoga Sanctuary is at 100 West 46th Street – go in the glass door and down stairs and you’ll see it. Lots of free street parking available. It’s just a few blocks west of the 46th Street exit off 35W. A little backstory: Kelsey has been a friend of mine for many years. When she approached me about this workshop idea and the series of poems she was writing, there was no way I would say no to partnering with this creative, energetic, positive, honest, enthusiastic friend. (Really she could’ve asked me to rob a bank with her and I would’ve said yes…) It has been fabulous to co-create this event with her and I would be honored for you to attend. ← The Beach Bodies were built! !